• Writers write: Who do you get your information from and more importantly, who do you trust to provide you with accurate information. In the gardening world, there are many who hold themselves out to be experts. You have a question, they have the answer. I am always suspicious of anyone who always has the answer and are never stumped. I have been in the gardening trade since 1977. I have worked with thousands of gardeners, listening to their problems and their solutions. I still get stumped. I still see things I have never seen before. Mother Nature surprises me and she does so all the time. There was a woman who used to lecture me, all the time, at my garden center, on how things should be grown. She was very much an expert in horticulture. She told me so. One day, I dropped by her house on my way home from work. It was a disaster. Weeds, junk, nothing pruned, nothing maintained. It was the worst garden on the block. “Hmmm” I thought to myself. Now, you might think this story is unusual, but it’s not. The City used to have a horticulturalist, who lectured on radio and television. He had the answers to all your questions and sadly, he had a very large following, who listened to every word he spoke. One of my friends lived near his home. What The City’s expert called a ‘work in progress’, his neighbours called a giant mess. His garden was in absolute chaos, the worst on the block. There was nothing growing that he talked about in his presentations. “Hmmm” I thought to myself. Same thing happened at Wascana Center. 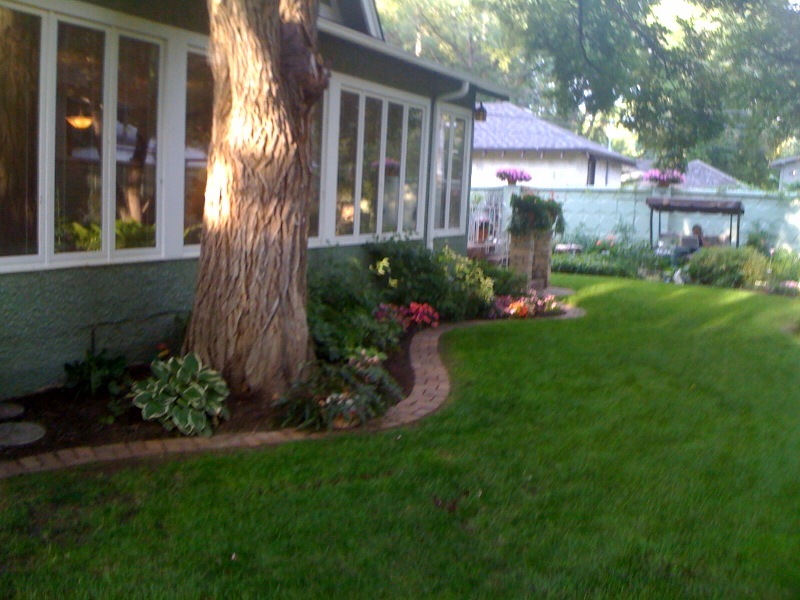 When I started out in this trade, thirty six years ago, there was a horticulturalist, an expert, at Wascana Center. She would brow beat me with her knowledge at horticultural meetings. She assured me that she knew everything and I knew nothing. I listened to her, after all she was an expert and I was a beginner. Then one of my staff told me that she lived three doors down from him and would I like to look at her garden? He assured me I was in for a surprise. I did that. I dropped by to visit her garden. 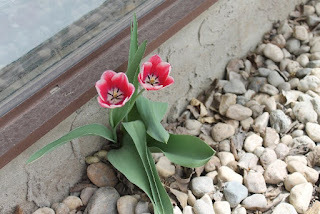 The front steps were falling off the house, the sidewalk had collapsed over the sewer line and the place was filled with weeds, three feet tall. Nowhere was there to be seen all these flowers and perennials she talked to me about. It was the worst garden on the block. “Hmm” I thought to myself, again. I have a garden that I am proud of, the one around back. I show you photos of it, all the time. My front garden, I keep it respectable but nothing fancy. In my back garden, the one surrounded by the brick wall, is a garden that visitors use the word “wow” when they visit. It is there that I garden, for myself, my wife, our pets and the birds. If you visit, then that is a delightful bonus. I am a good gardener but I am not an expert. Even after all these years, I am not qualified as an expert. I am different than those who hold themselves out to be experts, because I know that I don’t know everything. When I have a problem, I do not hesitate to reach out to William Hrycan (The Gardener) in Saskatoon, Michel Touchette (Jeffries’) in Portage, Rob Van Zanten (Pan American) in Surrey, Garfield Marshall (Advance Orchards) in Grand Forks and Gerry Aubin or Les and Calvin Vanderveen, who all live in Carman. I reach out to these people because they are very experienced members of the horticultural trade. They grow plants for a living and they have such a wide knowledge base. I get stumped, all the time, but I know who to call on when that happens. The answers to the questions that readers ask in The Garden Report are answered from a knowledge base far wider than my experience. The answers come from a slew of people, with many years of gardening behind them. Rob V.Z. grows millions of roses so just maybe, he might know something. And Garfield Marshall has grown just about every apple every produced on the prairies. He reminds all of us “that just when we think we are smart, Mother Nature makes fools of us all.” Great comment. The answers you get, I try to keep simple. Above all else, I don’t want readers to think that gardening is complicated. It’s not. But, the best gardeners follow a few simple and basic rules. That’s how you get a lovely garden. I try to present those simple and basic rules in a language that all can understand. And when I do tell you about planting tulip bulbs, it is because I was the dude planting them. I didn’t read it in a book. When I complain about having to weed the chickweed, it’s because my back is sore from doing it, not because I read it in a book. There are those of us who garden, then there are the experts. Long rant finished. • Garden Tip: Tulips are up and in full bloom wherever they were planted. A big hurrah as I adore my tulips. My own garden is filled with colour throughout. It is one of the best displays I have had. I think I planted a thousand tulips last year, maybe more, I forgot to count. My fears that the melting snow might rot the bulbs was unfounded. 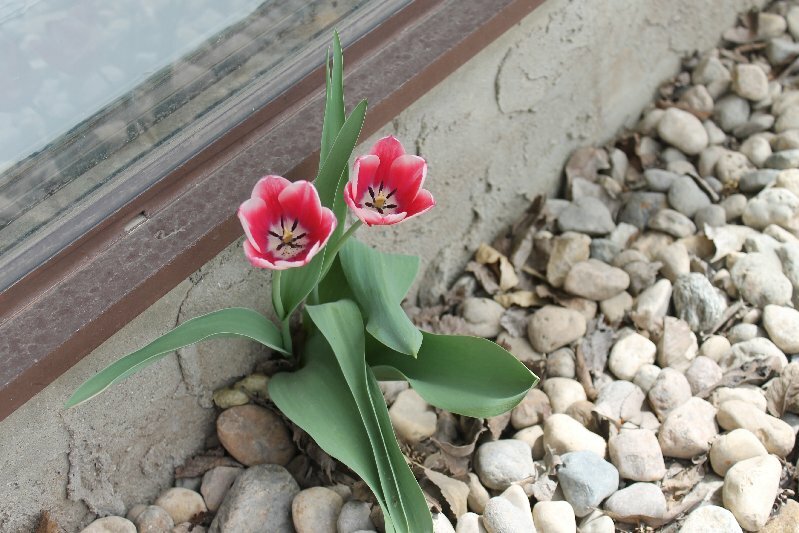 Tucked away into a corner behind my American Elm giant is one lonely ‘Apricot Beauty’ tulip. I planted those over ten years ago and all had withered away as the seasons passed, but one survivor came through this spring. I am calling it ‘Lazarus’. 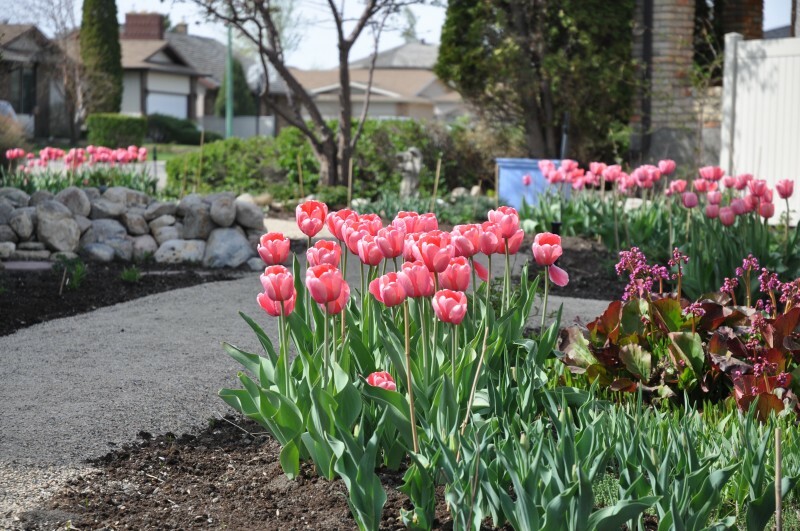 Tulips give gardeners a full four weeks (sometimes six weeks) of colour before annuals can be planted. 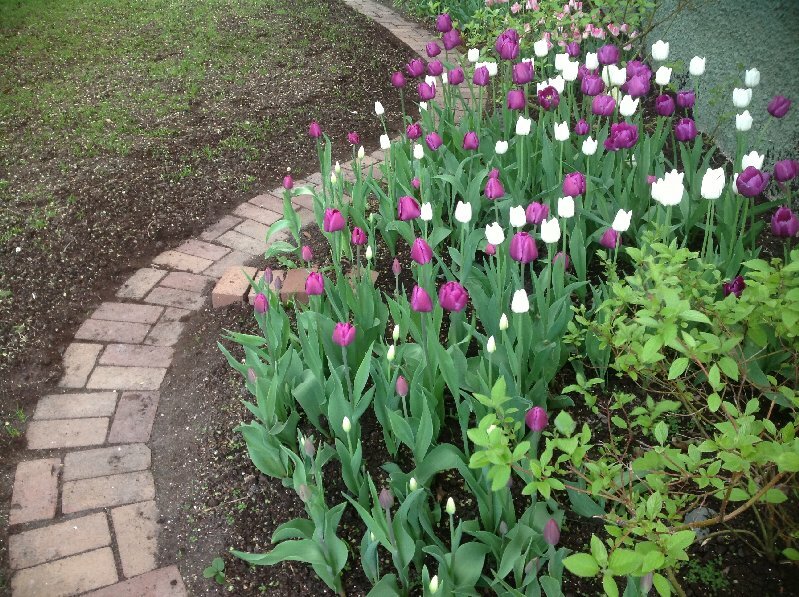 For the new gardener, tulips must be planted in the fall. I planted over a thousand tulips last fall-this is from today! • Garden Tip: What to do? Everything to do! Rake, tidy, fertilize, plant, pot up your containers and baskets. Repeat. There was so much to do this past week in the garden that I didn’t think I would be getting out #133. That was until Friday when it rained and then I had an excuse to be inside and write. • Rayanna’s Report: Thanks for all the kind words for this new writer. I am back in Edmonton. My mom and I flew back on Wednesday. I miss my Grampa. I miss everyone in Regina except for that guy who lights his head on fire at the football games. Grampa ‘s fun to hang out with. He told me about how his grandfather was born in 1882, his dad in 1904, he in 1951, my dad in 1979 and me in 2012. He calls it history. I call it really old stuff. Grampa told me that we are descended from hundreds of years of Scottish sheep farmers and Newfie fishermen. We’re not related to anyone famous or notorious but we are related to each other. Does that make sense? Get this, on the singing front. Grampa does like two hundred verses of ‘This Old Man’ to get me to sleep and this week he invented a new one. It’s called ‘What do we do with the drunken baby’. It sounds like ‘What do we do with the drunken sailor’ but with funnier words. He dances when he sings that one even though the old boy has one gimp knee. I would tell you more but there’s a warm bottle of milk waiting for me and duty calls. • Arts’ Festival: We took in two good concerts. The Regina Mandolin Orchestra and The Jazz Bandits. Both groups are community bands and played their gigs at Westminster. Who was not out for The Arts’ Festival Street Fair? What a monster that has become. I would hesitate a guess of thirty to forty thousand people were out for this year’s edition. You could sign a petition, listen to a blue grass band, eat a pound of fudge, buy a belt or a sign for your lawn or a pair of earrings, all along 13th. I think they said there were 350 booths this year and I believe it, though I didn’t count. As for our readers, I got exceptionally good quality hugs, with Maureen’s blessing, from Margo Soriano, Bev Monk, Boopy Singh, Robin Poitras, Dani Mario, Marlo V., Chad Jacklin, Margaret Bessai and someone who I don’t think I know but they seemed to think I know them. I gave them a hug anyways and why not? This is Canada. It was a great afternoon, worthy of several exclamation marks, but I reserve the right to edit myself! • Blooming this week: I have seen forsythias, Schubert Cherry, apple, cherry and Mayday in bloom along with the fall bulbs. • Writers tip: I try not to use the same strong word, a second time, in a sentence or a paragraph. It is okay to use basic words again such as I, they, we, are, us, our, then and so on. What you don’t want to repeat are words such as phenomenal, powerful, incredible, overwhelming, scintillating, outrageous and similar words to those. If you do, you lose your effectiveness. • Garden Tip: Use white flowers to separate strong colours from each other. 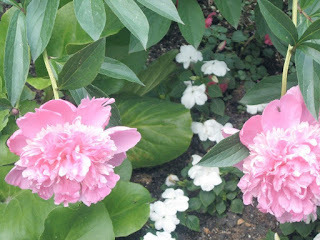 When I plant my impatiens, I use white ones to separate the violets, lilac, mauve and pink ones. Another thing that is effective is to plant your colours in batches. 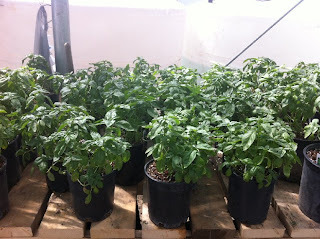 I use three trays of pink impatiens, then a tray of white and then three trays of mauve. Better to do that, than to alternate each flower. • Garden Tip: If you have a small bush or perennial to transplant, you should get that done a.s.a.p. Best to dig as big of a root ball around the plant as you can lift. Plant it into the new hole, slightly deeper than its original hole, back fill with a peat soil mix and fertilize with a 10 52 10 fertilizer which is a root starter fertilizer. Also, I have found transplant success using a Plant Starter that contains IBA which stimulates root development. at the back of the garden. • True, true, true: A few people, including my Mrs., ask why I spend a couple thousand bucks on bedding plants every spring, for my garden. Here is my rationalization: I don’t drink, I don’t smoke, I don’t use drugs and I don’t gamble. Those four things, save me lots of money, perhaps twenty grand a year. If I smoked a pack of day, it would still amount to more money than what I spend on all the beautiful flowers I buy and grow. Somehow, I feel I am still ahead of the game. I might have an addiction to lovely plants but at least it is a healthy addiction. 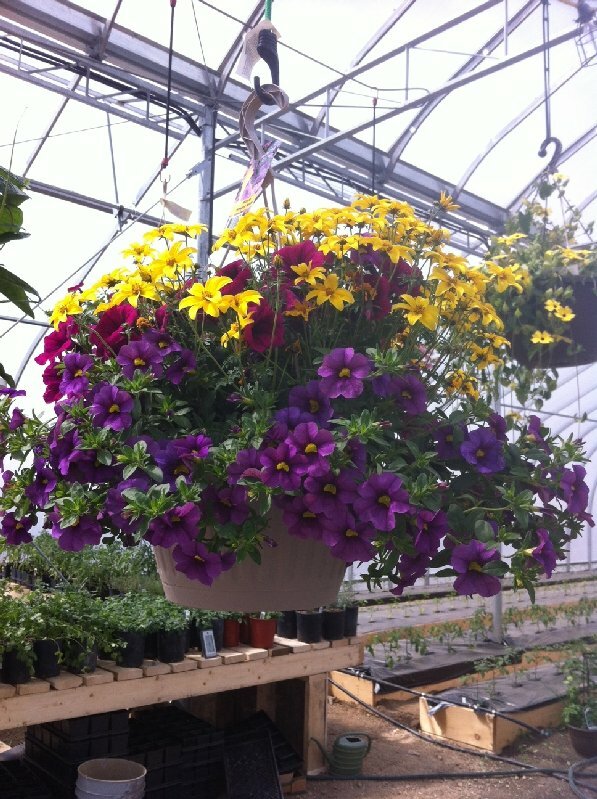 No one has ever gotten upset because they caught me embracing a lovely begonia basket or kissing a pot of pansies. I rest my case, if not my sermon. • I have told this one before: Many years ago, I had a woman try to return a hanging basket of geraniums that she had purchased the year before. She told me that she had waited several weeks for them to start growing again but nothing had happened. I told her that geraniums are an annual and that they only grow one year. She told me that I was “ridiculous. No one buys something that only grows one year!” So, ask me again if I miss the greenhouse business? 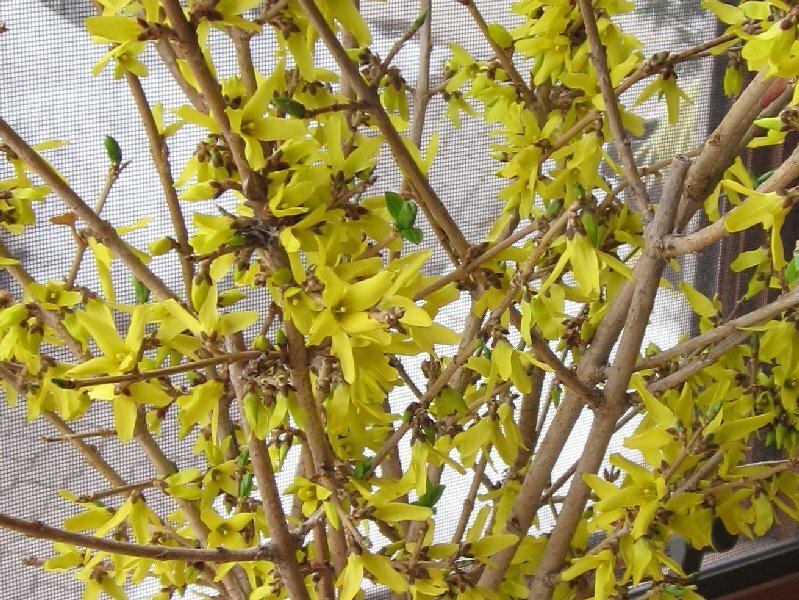 • Garden Tip: If you like yellow in your garden, use it sparingly, in accent groups. That way, it will shine through. It is such a strong colour that if you use too much of it, it will be lost. Now, every reader who thinks they are an artist is going to disagree, but that’s the chance I take, putting it out there. Middle aged, straight men have no business commenting on colour selection according to my gay friends. • When: Next Saturday, June 1st, 9:00 a.m. until 10:00 a.m. (just one hour or two at the most) until everything is sold. • What: Some plants I grew, some plants Brad Crassweller grew and some extra plants that I bought from Vanderveen’s but now I don’t need. This includes tomatoes, cucumbers, a few dracaenas, lots of dill, lots of basil, lots of cilantro, peppers, lots of strawberries, a few daylilies, oregano, thyme, rosemary, a few trays of petunias, a few trays of impatiens, some beautiful hanging baskets and potted plants. Everything is well grown and is priced accordingly. This is not a ‘fire sale’. I am not giving plants away. • Why: I have extras and so does Brad, with his new greenhouse down by Cinema Six. • Who: Me and Brad. • Help me out: Please don’t come early or tell me a sob story about how you won’t be in town on Saturday and need to come by Wednesday night. I want to keep this simple. Saturday morning, for one hour, I am having a driveway sale and then that’s it...I am retired again at ten a.m. I only accept cash. While you are here, you are welcome to have a wander through my private back garden. Some (not all) of the tulips will be still in bloom. This sale is only open to the neighbours and to readers of The Garden Report. I am not putting out any ads. If it rains, we will be selling the plants inside the garage. If you want to drop by just to say hello, that is great. I would be pleased to see you. • Thanks for reading...Rod McDonald in sunny and windy, but thank God no snow, Regina!